By Anna Monus in E-Commerce. Updated on October 31, 2018 . Cart abandonment is a standard problem each e-commerce site encounters sooner or later. According to the Baymard Research Institute, the average shopping cart abandonment rate is as much as 68.63%, a value that’s calculated based on 33 different studies. Paying attention to checkout UX, and designing for the specific needs of your target audience can decrease the number of customers who abandon their shopping at the last crucial moment, in midst of the checkout process. In this post, we’ll have a look at the reasons why cart abandonment happens, what designers can do about it, and how some notable e-commerce websites deal with the problem. It can be a frustrating task to figure out why your customers abandon your site during the checkout process. While e-commerce stores can specialize on many different niche markets and product types, there are some universal rules that can be applied for most online shopping environments. While #3 can be deemed as a normal customer behaviour, the rest implies existing user experience problems. To set up a successful checkout process with low cart abandonment rates, it’s important to understand how your audience "works", as in the psychology behind their behavior. Stanford University’s Persuasive Tech Lab recommends a specific behaviour model that makes it possible to design core processes – such as the checkout process – in a way that increases conversions. 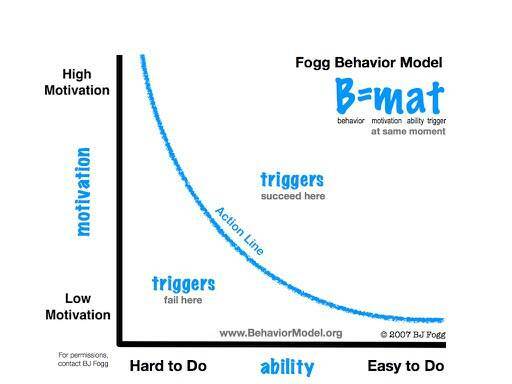 The Fogg Behavior Model claims that user behavior depends on 3 key elements: motivation, ability, and trigger. When a desired behavior doesn’t happen, it’s because at least one of these elements is missing. To solve these pain points of your customers, it is a good strategy to figure out which psychological element is lacking. For instance, when your users don’t understand how their shipping cost is calculated, they lose their motivation but you can gain that back by increasing their ability to get quick information about shipping costs. Of course, in real life the analysis is way more complicated, but it’s always useful to approach user experience issues, such as cart abandonment, from a psychological aspect. In order to keep your customers motivated, one of the most important things you need to do is to reduce the interaction cost, which is defined by the Nielsen Norman Group like so. 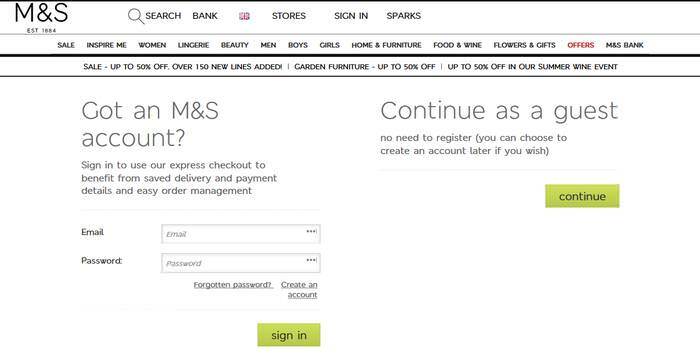 In terms of checkout UX, this means you need to simplify the checkout process as much as it’s possible, such as keeping fields to the minimum, letting customers pay easily, and making the checkout sequence simpler. This way you can increase focus and reduce hassle, therefore giving the necessary ability to your customers to do their shopping. For instance, take a look at Ebay‘s checkout process. They only ask for the necessary data, and pre-fill many fields based on the registration data. As such, customers need to give their personal data, such as their shipping address, only once, then in each shopping instance they just need to fill in the fields that may differ in each purchase: payment, postage, coupon code, and charity donation. Customers may get lost in the checkout process easily, therefore giving them the right visual feedback at the right time can be a huge factor in checkout optimization. Amazon, the world’s largest online retailer gives a comprehensive visual feedback at every part of the checkout process. 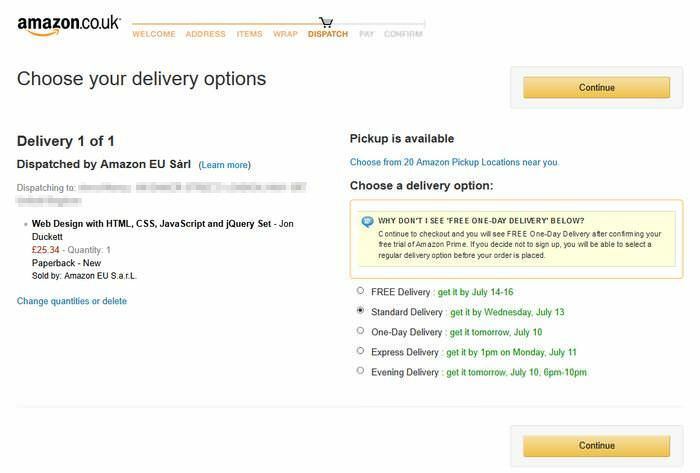 Amazon uses a separate UI for the checkout process, that is easily distinguishable from other parts of the site, and doesn’t contain distractions – not just the sidebar but the top navigation is also cleared off the screen. Checkout steps are visualized on top of each checkout screen, which gives an easy-to-understand visual feedback to customers about their current stance in the checkout process. Different kinds of information use different colors as well, and the Continue button appears at both the top and bottom of the screen, making it clear for customers what the next task is. Making customers feel they have a say in their purchase process can increase their motivation for sure. However it’s not always easy to decide when it’s better to let them have a choice, and when it’s better to anticipate their needs. When speaking about e-Commerce, one of the biggest customer deterrent is forcing them to register, "Having to create a new user account" has been the second most frequent reason for cart abandonment in the aforementioned report. 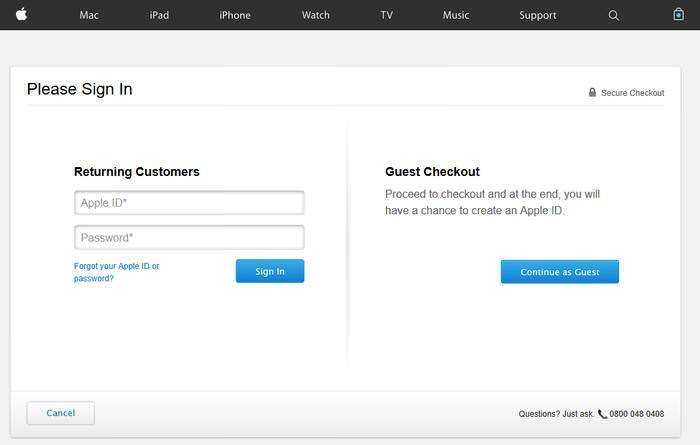 Apple’s online stores makes a good job in providing customers with a guest checkout, they display the two options, "Returning Customers" and "Guest Checkout" right next to each other, on the same level of visual hierarchy. They also assure customers that they will still able to create an Apple ID at the end of the process if they choose the guest checkout. Guest checkout is only one example of giving customers control in the form of clearly explained options, there can be many different things to consider based on the type of your store, such as shipping options, payment options, sending the product as a gift, coupons, etc. Lack of customer trust is the reason for "concerns about security payment", one of the biggest customer pain points that can cause cart abandonment. Baymard Institute’s survey results show that perceived security is more important for most customers than actual security, as most of them don’t understand technical terms, such as TLS/SSL encryption. This is why trust badges and labels can work well in gaining customer trust. 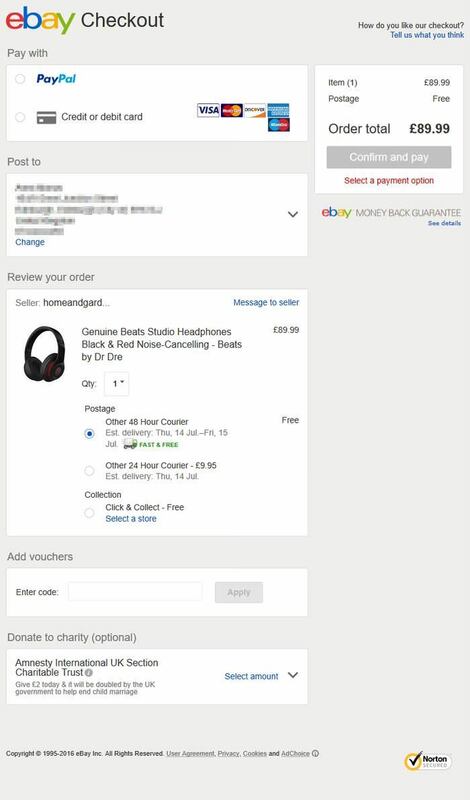 For instance, Ebay uses both a "Money back guarantee" label and a Norton Security badge, and Apple also assures users about security by using the "Secure Checkout" label on the top left of their Checkout Login screen – they calm customer worries before the checkout process begins (see both examples on above screenshots). 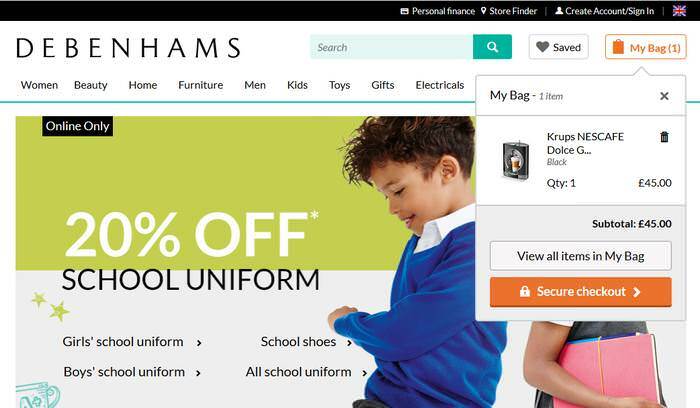 Debenhams, a popular British retailer uses a different design; they have integrated their trust label into a large orange Secure checkout button. This way they combine the ability and trigger elements of the aforementioned Fogg Behavior Model. Summarizing the order before payment in an easy-to-understand manner, with all occurring costs detailed is also a feature without which customer trust can hardly be achieved, it’s not a coincidence that most big e-Commerce sites implement it.